Oh beautiful, for spacious hot tub, and amber folds of leather. For orange paint and landau top, above four comfy seats! Cadillac DeVille, sweet Cadillac DeVille! Jalopnik sheds its grace on thee. And crown thy continental kit, with loads of chrome, and bitchin' custom grille! 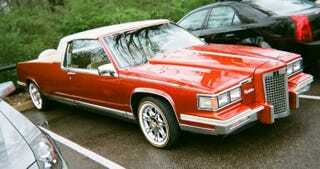 1984 Chrysler LeBaron: Does The Continental Kit Make It Better?